Creates highlights, balayage and reflections with an quick and easy application. 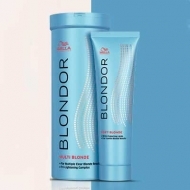 Wella Blondor Freelights Powder is a bleaching powder specifically designed for the use in freehand technique (as opposed to the traditional application). This easy-applying creamy texture creates the natural sun-kissed highlights in your hair. Enriched with natural clays and whitening agents to create a natural long-lasting color result. 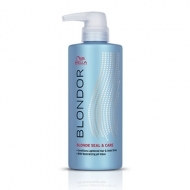 Developed with ACTIFUSE to allow a precise application with reduced dilation * during the bleaching process. The perfect product to create ombre and balayage hair with top freedom. Apply the bleaching mass evenly to the sections to be highlighted (on unwashed hair). After a development time of 15 minutes using additional heat (or 30?40 minutes without heat). FIRST TIME APPLICATION: Mid-lengths and ends in first step and root area as second step. Before using the product test it as described on the package. In case of allergic reaction, stop using the product immediately.